The road of life often produces unexpected twists and turns, and leads to careers which, while unanticipated, prove ultimately to be fulfilling and deeply rewarding. A prime example of this principle is Ed Abramoski. Eddie Abramoski, a standout high school football player in Erie, PA, received a football scholarship to Purdue University. A back injury ended his football career in his sophomore season, however, and turned his athletic career in a different direction. At age 21, Abramoski became the youngest Division I head trainer in the nation by assuming those duties at the University of Detroit. He also saw duty part-time as a trainer for the Detroit Lions. When Lions’ assistant coach Buster Ramsey came to Buffalo as the first coach of the Buffalo Bills in 1960, he brought Abramoski as a charter member of the Bills’ family. Abramoski joined the Bills at the birth of the American Football League, when the survival of the league and it franchises was a constant concern. At that time, Abramoski certainly never foresaw the length of his stay in Buffalo. However, Abramoski served the Bills – and their fans – with distinction and dedication for 36 seasons, a tenure exceeded only by that of team owner Ralph C. Wilson, Jr.
Over the years, Abramoski taped the ankles and treated the injuries of every player ever to pull on a Bills’ jersey. Given his gregarious and generous nature, Abramoski also developed a role as friend, confidant, advisor, and counselor to hundreds of Bills players. From Kemp to Kelly, from Tracey to Thomas, from Raub to Reed, two generations of players, including twelve Smiths, nine Joneses and six Browns, entrusted not only physical ailments but also life’s problems to the wit and wisdom of Eddie Abramoski. The Bills’ ebullient former trainer readily acknowledges that his years with the Bills have provided him a lifetime of cherished memories. Abramoski, the life-long fan, has been a first-hand witness to the rise of the Bills from humble beginnings in War Memorial Stadium to the glory years at Rich. Just as Abramoski’s talents were a constant for the Bills through the years, so too was his genuine love of the job. In the field of physical training Abramoski has had few peers. 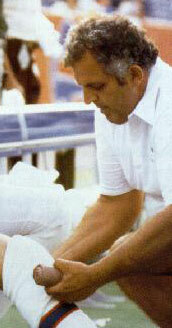 In 1986, he was honored with induction into the National Athletic Trainers Association Hall of Fame. On that occasion, team owner Ralph C. Wilson, Jr. remarked that “the loyalty, dedication and professionalism of Eddie Abramoski is as unfailing today as it was the day he joined our organization in 1960.” In 1994, the Bills honored Abramoski with a special version of the Ralph C. Wilson Distinguished Service Award for long and meritorious service to the club. In 1996, Bills fans – and Buffalo sports fans in general – finally realized an opportunity to recognize the outstanding contributions which Ed Abramoski has made to football, and life, in Buffalo.